Hibernians retained the Louis Borg Cup for a second successive season when they strolled past Depiro in the two-legged final. This was the 19th success for the Paolites who closed off the tie by the end of the first half of the opening leg as Depiro sorely felt the absence of their import player who returned home late January. Hibernians: E. Micallef 2, E. Cassar 6, K. Calleja, S. Brincat 4, B. Agius 3, J. Abela 3, S. Abela 11, A. Simmons 41, N. Farrugia 3, H. Al Tumi, K. Caruana 2, L. Duncan 7. Depiro: Ni. Agius 12, G. Mifsud 14, C. Camilleri, S. DeMartino 5, D. Said Hollier 4, M. Scicluna, N. Hili 2, C. Ciantar 6, A. Mifsud, E. Cassar. Referees: Z. Dobrosavljevic, N. Azzopardi, C. Xuereb. Depiro: No. Agius, Ni. Agius 11, G. Mifsud 12, C. Camilleri, S. DeMartino 12, D. Said Hollier, M. Scicluna 1, N. Hili, C. Ciantar 10, A. Mifsud, E. Cassar 2. Referees: D. Torok, I. Simic, M. Hraisha. After a slow start by both teams in the first game, Hibs regained their composure and quickly made clear their intentions of trying to shock their opponents and open an early lead. In fact a 14-0 run, with Amelia Simmons, Sophie Abela and Leanne Duncan sharing most of the points, spearheaded Hibs to a 18-4 lead at the end of the first quarter. 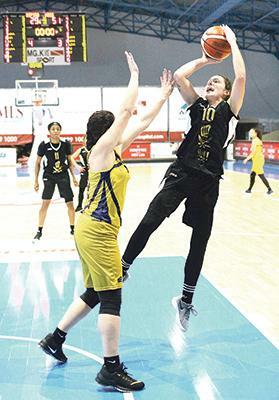 The tempo remained the same in the second quarter with Hibs extending their advantage much further with Simmons, who notched an impressive 41 points in the first rubber, much in evidence helping her side to a 35-point half-time margin, 46-11. “I am proud of the team for sticking with the game plan and not taking our opponent lightly,” Simmons told the Times of Malta. “We came off a tough loss in the past weekend and it was good for our team to respond strongly in the Louis Borg Cup. It was great to see everyone contribute, whether it was playing defence, rebounding or encouraging one another. A nine-point Hibs run characterised the start of the second half and although Depiro had some points off a Nicole Agius trey and a Gabriella Mifsud hoop, the Paolites remained firmly in command and further extended their advantage. In the last quarter, Depiro managed to find their shooting touch and even won the quarter 24-14 having treys from Agius and Mifsud as well as hoops from Stephanie Demartino and team skipper Claire Ciantar. However Hibs were still firmly in command and moved towards the second leg with a hefty advantage. If anyone was thinking of a Depiro comeback in the second leg, such an idea was immediately eradicated as Hibs set up an early superior tempo, including a first quarter 15-0 run with early hoops from Sophie Abela and Simmons and treys from Duncan and Elena Cassar. Shorn of the services of an import player, Depiro once again could not easily find their ground in the first half going into the interval 10-38 behind with Hibs having also baskets from their influential guard Samantha Brincat and shooting guard Emma Micallef. Micallef acknowledged the fact that their cause was helped with Depiro having no import player but also put an emphasis on the fact that they had ousted the menacing Starlites side in the semi-final stage. “We are extremely happy with this success,” Micallef said. “Even though the final score might indicate that this was an easy cup to win, the reality was that we managed to beat a strong Starlites side in the semi-finals in order to make it to the final. “This final was a mental game as well, since after taking such a lead in the first game, it was not easy to remain concentrated for the second leg as well. Hibs coach Tony Camilleri, who took over the side early in January, said: “Although the final against Depiro turned up to be a one sided affair also due to their lack of a foreigner, one has to keep in mind that we had to eliminate a strong Starlites team in the semis to reach the final. The last part of the two-legged series was a more balanced affair as Depiro managed to keep at par with their opponents, the latter also taking the opportunity to give court minutes to their young bench players. At the end of the final, the Hibs clan were presented with the winning trophy from the MBA president emeritus Louis Borg.